Biography:Nirmaan Mission is in the state of Orissa, which is only 1.5% Christian. There have been many obstacles and much persecution among Christians in Orissa over the past year including deaths, with homes and churches being destroyed. Nirmaan Mission continues reaching out in spite of the situation with 8 churches, 15 house churches and 5 prayer cells in the interior and rural areas of Orissa. The church has a large children's ministry reaching over 15,000 Christian and non-Christian children alike. Each year the church holds a large youth gathering where almost 300 youth can come together in ministry. The church focus is on church planting, youth and children's ministries, literacy ministry and social development programs. Their ministry includes the poor, illiterate and segregated people who are sidelined from the main stream of society. 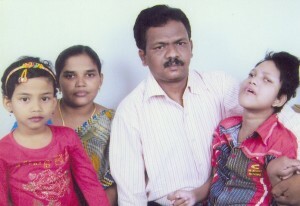 Jephat and Anupoma have experienced many miracles in their walk with the Lord, including their first daughter surviving after a deadly illness when doctors gave up on her. Strengths: Jephat and Anupoma are strong administrators who show Jesus' love to everyone and never give up.